In recent years, shark cage diving has become one of the most popular extreme sports in the world: it gives us the chance to come up close with the oceans largest predators and to feel the incredible adrenaline rush which accompanies them. However, many of those brave enough to go shark cage diving in Cape Town have the wrong ideas about these beautiful creatures; after watching films and listening to horror stories which paint the great white sharks in a formidable and terrifying manner. Extensive research into the behaviour and characteristics of the great white shark can now calm some of our nerves despite their appearance and strength scaring the bravest of us. By knowing a little bit more about what to expect about great whites when going shark cage diving in Cape Town, you’ll have a more enjoyable experience and will appreciate observing the creatures even more. They do not eat humans; in fact they can’t stand the taste of us. Similarly, human beings shouldn’t eat shark meat as it’s incredibly high in mercury. They have been known to attack humans, however it’s mostly been by accident when they mistake us for seals. Great white sharks live along all coasts, except for the coast of Antarctica as they can’t survive in the extremely cold waters. It is still unknown how long they live but some believe they can live up to 25-30 years old. As these sharks are roaming it is difficult to determine their full lifespan and research on the great white shark is still in its infancy. The biggest shark that has ever been recorded was 20 ft long but in the past many unconfirmed catches were measured at around 30ft in length. None of these previous measurements can be justified however and may have been classic fisherman’s tales. Sharks roll back their eyeballs when attacking prey in order to protect their eyes from the scratches of defensive victims (This fact as meant many to believe that sharks are evil. Realistically they’re just predators protecting themselves). Sharks do however have scratches and scars on their snouts from their prey. Great white sharks can consume several hundred kilograms of food in a single feed. Great white sharks have an enormous liver which weighs up to 24% of their entire body mass. The heaviest great white shark that has ever been caught weighed 2 268kg. Great White Sharks can swim up to 40km/h and can launch their whole body out of the water when hunting prey. Great white sharks are not kept in captivity as they become disorientated and start swimming into the walls and glass of their tanks. By knowing something about great white sharks it’s likely that you’ll grow a respect for them while feeling more comfortable with the idea of coming close to one of them. 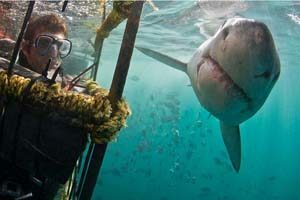 Shark cage diving in Cape Town offers us the chance to see these beautiful creatures in the flesh. As there are approximately only 10 000 great white sharks left in our waters, this is truly an opportunity not to be missed. Not only will you have the adrenaline rush of the lifetime, but you’ll have a newfound appreciation for the creature that you once feared, and have the opportunity to watch them hunt, breach and feed in Cape Town’s waters.